We get the job done right the first time! call (270) 683-5124 today. Peay Electrical Contractors has become known throughout the Owensboro, KY area for its reliable and economical electrical service. We can provide you with a free estimate for all of your residential or commercial electrical needs. At Peay Electrical Contractors, we are dedicated to performing above industry standards at every electrical job we take. Our goal is your complete satisfaction, whether you need an old home rewired, need landscape lighting installed, or have an electrical problem you need repaired. At Peay Electrical Contractors, we have the experience you will want to ensure your home or office is wired for the best and most economical and reliable service. Safety is our main concern, so we take extreme care and pay attention to every detail when troubleshooting a repair job or installing new wiring. 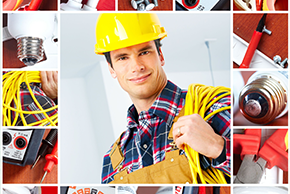 When you are in need of a commercial electrician or residential electrician, you can count on us to get the job done thoroughly and efficiently. If you need an emergency electrician, you can count on us for that, too. We know that faulty electrical wiring is a leading cause of house fires in the U.S. This is why, despite what you may have heard from do-it-yourself TV shows or those big box hardware stores, electrical work is something that should be left to the pros. When you need reliable and cost effective electrical work, trust the local electrician professionals that your neighbors in Owensboro know and trust. Contact us at Peay Electrical Contractors today to arrange for a free estimate.